The Part theme layout in Beaver Themer applies to the hooks built into the theme so you can place pieces of content in places other than the header, footer, and content area. Note: Most themes support archive, singular, and 404 layouts out of the box. However, to support the Theme Builder header, footer, and part layouts, themes must be built a certain way. See the Related Articles for the list of themes that are fully supported and more information about adding support for themes that allow it. Tip: If you're not sure where these positions are on a page or post, see the primer on WordPress content and theme areas in the Related Articles. The order field requires an integer from 0 to any number. You only need to change this number if you have two part layouts in the same position. The lower number appears above the higher number. For example, if you have a warning with order 0 and a banner with order one, the warning will appear above the banner in the same position on the page. 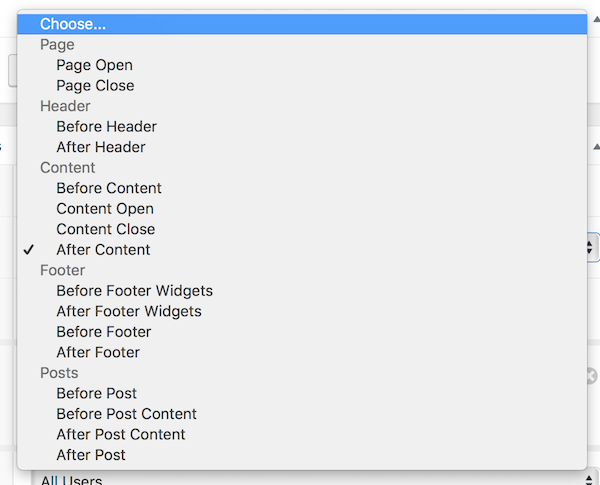 Rather than an initial layout for the Part theme layout, the full set of Templates from Page Builder pops up when you launch Page Builder to edit the theme layout for the first time. This lets you insert any of the default Page Builder templates or your own saved layout templates. For example, if you've already built a banner on a regular page with Page Builder, you can save it as a template and then use it in a Part theme layout in a number of new locations outside of Page Builder's range.